Your home expresses the way you live, so leave a lasting first impression for your visitors and guests with Bristol Aluminum Window & Siding Company’s Entrance, Patio and Storm doors – designed for both beauty and functionality. Greet the world in style with stylish designs, glass inserts, and unparalleled craftsmanship. Mix and match a variety options to create that custom look for any style or requirement. Whether you want to let in more light with a glass sliding door, install a beautiful new entrance door or protect your home with our storm doors, Bristol Aluminum Window & Siding Company has a door to fit your needs. • R6 insulation value of polyurethane foam energy core is over 7X the insulating value of a 1” wood core! • Foam energy core blocks wind and rain and keeps your house cool in the summer and warm in the winter. • Sash interlock system provides weatherproof draft barrier to keep out wind, heat and cold. • Polypropylene weather strip seals frames and windows to resist drafts, dust and moisture. 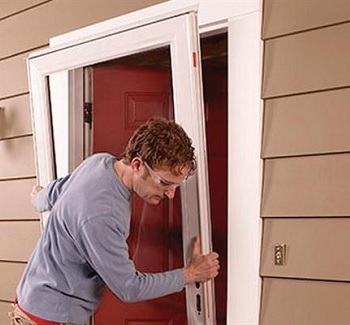 To find out more about how door installation by Bristol Aluminum Window & Siding Company can increase the value, appearance and energy efficiency of your home, give our experts a call today at (401) 253-7226.